David Ramirez played an intimate show at Colectivo&apos;s Back Room on Friday night. 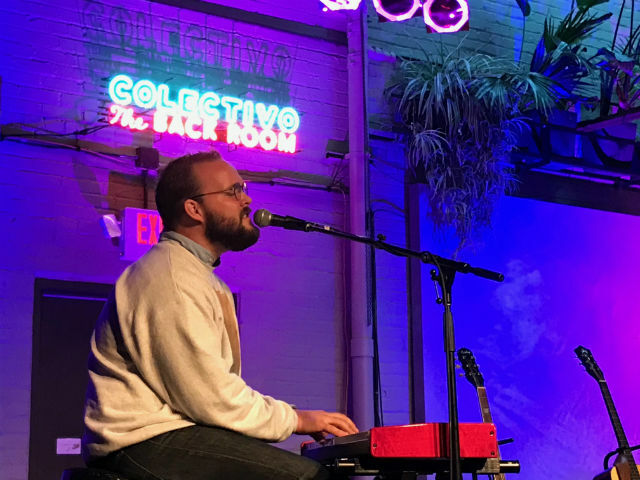 Published June 22, 2018 at 11:50 p.m.
Singer/songwriter David Ramirez played an intimate show Friday night at the Back Room at Colectivo on Prospect, and if you were there, it was a show to remember. That's due not only to Ramirez's heartfelt and emotive performance (and that of opener Matthew Wright, too) but also to the fact that everyone who bought a ticket online gets a link to download the performance afterward. The show was part of Ramirez's second Bootleg Tour, during which each show is being recorded and shared with the audience for posterity. Every gig, in a sense, is one for the ages. "I affectionately like to call the tour 'Relive the Misery,'" Ramirez said at the end of the night. Ramirez did his first Bootleg Tour in 2016. The Austin, Texas-based Ramirez writes earthy, often dark, often quiet, often stirring introspective Americana songs that work perfectly in the intimate setting of the Colectivo Back Room, where his low voice – think Nathaniel Rateliff at his most simmering – could fill the space and envelop the audience. As you'd expect, Ramirez focused heavily on his latest record, "We're Not Going Anywhere," released last September, but he also performed songs from his three other full-length records, too. From the new one, he did the melodic "Watching From a Distance," accompanied only by Wright's piano, "People Call Who They Wanna Talk To," "Telephone Lovers" and, to end the night, the record's closer, "I'm Not Going Anywhere," a defiant snub at mortality. Ramirez's rootsy rock has elements of folk and country, but it's edgier and often more passionately rendered, and he notched it up to 11 on songs like "Hold On" and "I'm Not Going Anywhere." At other times, as on "Watching From A Distance" and "Harder to Lie," Ramirez, clad entirely in black and wearing a baseball cap that read, "Let Go for Dear Life," took a more understated approach. 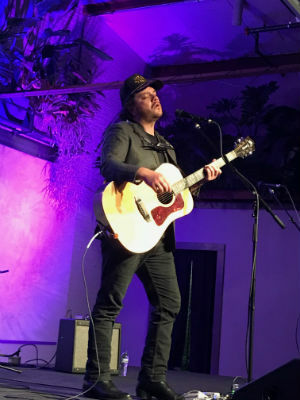 Playing mostly acoustic guitar – though he did use an electric early on, too – Ramirez was accompanied by Wright on piano for about half the set. A Nashville-based pianist, singer and songwriter, Wright also opened the show with a 45-minute set, and provided a nice balance to Ramirez's darker style. Wright was comfortable and conversational, much like his songs, which draw on his breezy voice (which recalls Jackson Browne and Paul Simon) and his piano style (which conjures Randy Newman). Opening with a cover of Simon's "Still Crazy After All These Years," Wright then performed a number of personal songs with often melancholy lyrics counterbalanced by Wright's humor and often jaunty melodies. Ramirez said the show was his first in Milwaukee in about seven years. "When I was coming up to Milwaukee regularly," he said, remarking on the size of the crowd, which filled but did not pack the room, "I used to play over at The Jazz Estate for like four people." "People Call Who They Wanna Talk To"